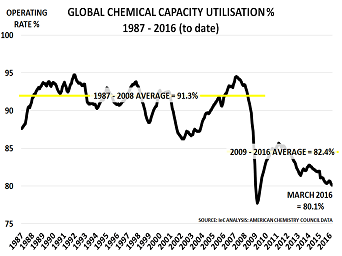 Capacity utilisation (CU%) in the chemical industry has long been the best leading indicator for the global economy. The IMF’s recent downward revision of its global GDP forecast is further confirmation of the CU%’s predictive power. As the first chart shows, the CU% went into a renewed decline last October, negating hopes that output might have stabilised. March shows it at a new low for the cycle at just 80.1 per cent, according to American Chemistry Council (ACC) data. 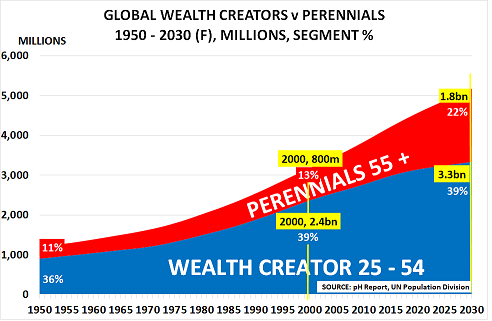 By comparison, the CU% averaged 91.3 per cent during the baby boomer-led economic supercycle from 1987 to 2008. This ability to outperform conventional economic models is based on the industry’s long history and wide variety of end-uses. It touches almost every part of the global economy, enabling it to provide invaluable insight on an almost real-time basis along all the key value chains – covering upstream markets such as energy and commodities through to downstream end-users in the auto, housing and electronics sectors. 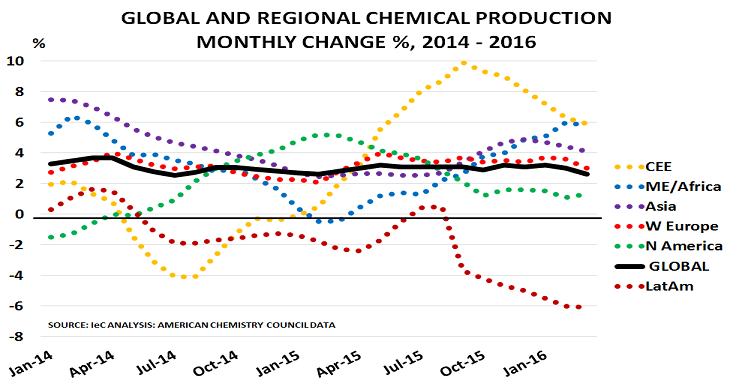 Chemical industry production growth provides similar real-time insight into the major economies, using a year-on-year comparison. Current data for the Bric economies is particularly revealing, as the second chart highlights. China’s post -2008 stimulus programme had provided critical support for all four countries. But as discussed on beyondbrics last year, China’s adoption of its New Normal economic policies during 2013 initiated a Great Unwinding. 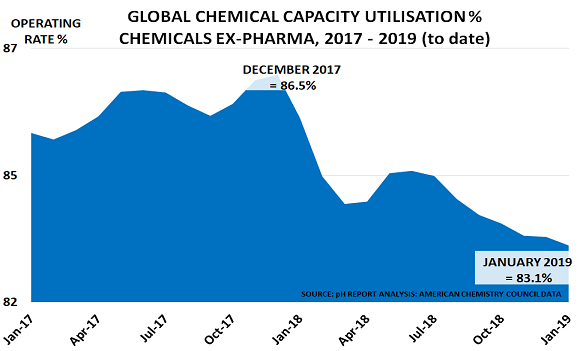 Chemical industry production growth has nearly halved since 2014 to just 5.7 per cent a year today. And as discussed last month, much of this output is now aimed at boosting exports (to preserve jobs) rather than to supply domestic demand. 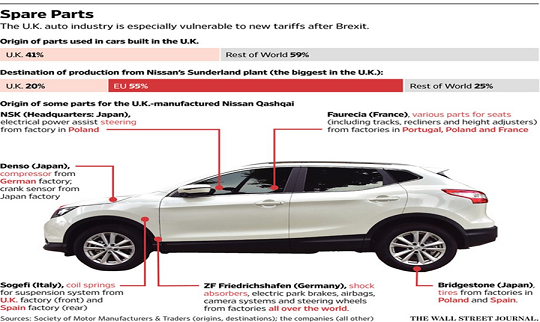 There are an increasing number of key products where China has moved from being the world’s major importer to a net exporter – with a consequent negative effect on margins. Brazil was the early loser from China’s change of economic direction. Its monthly output declined very sharply in early 2014 as China’s stimulus-related infrastructure and construction demand slowed, and growth turned negative in June 2014. Output then staged a minor recovery in the middle of 2015, but has since fallen back to -4.6 per cent again. Brazil now no longer needs to import major polymers such as polyethylene, and has instead become a net exporter. Russia was similarly impacted by China’s policy reversal, and its monthly output went negative in mid-2014. The collapse of the rouble then temporarily mitigated the downturn, by supporting exports and increasing the attractions of local production versus more expensive imports. But output growth has since staged a precipitate decline since last summer, falling by more than two-thirds from September’s peak of 14.9 per cent to just 4.2 per cent in March. 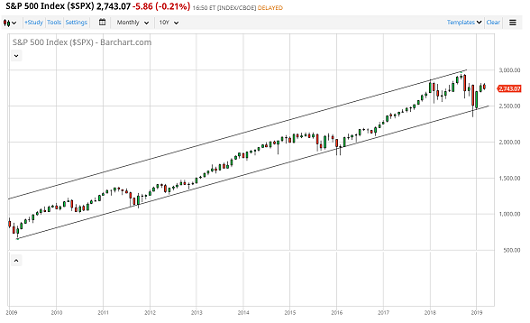 India has seen similar volatility. Output growth turned negative during 2014, but then staged a mild recovery in 2015 before a renewed decline took place, leaving March output barely positive at 0.4 per cent. In principle, India’s domestically oriented economy should make it more resilient to China’s slowdown, but it is still impacted by the second-order effects of increased competition in Asian markets. Not only is China ramping up its own exports of key products, but companies that had formerly relied on exporting to China are now having to find new homes for their product. These developments in capacity utilisation and output confirm that major changes are taking place in the global economy and the formerly high-flying Bric economies. 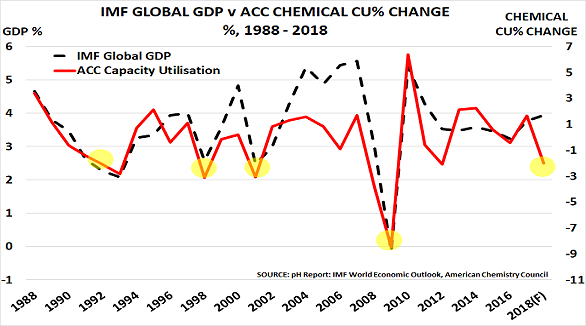 Policymakers would perhaps do better with their forecasts if they looked beyond their theoretical models – and focused instead on the chemical industry’s proven ability to provide real-time insight into the underlying transformation taking place in global demand patterns.